Barbara Jean Hicks is a beloved children’s book author from Port Hueneme, California. If you visit Barbara’s website, you’ll discover that she is not only a writer, but a lover of cats! 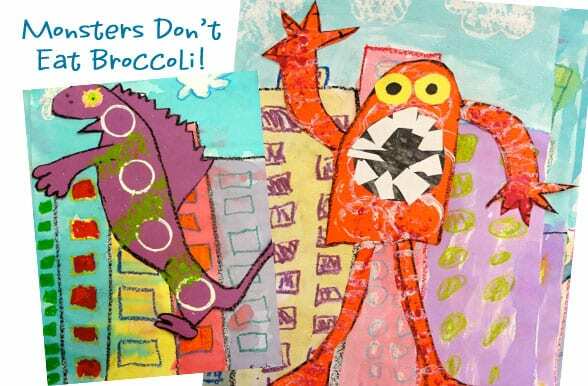 I’ve had the pleasure of interviewing Barbara recently and as a tribute to her adorable book Monsters Don’t Eat Broccoli my first graders created some very hungry monsters (full lesson tutorial below). Patty: I love to read picture books to my students. They seem to like every kind of story. What sort of books did you enjoy as a child? Barbara Jean: Love-love-LOVED Dr. Seuss! The silliness factor, both in the text and the illustrations, and the wonderful nonsense rhyme made me want to read them over and over. I also loved a picture book I can tell you a little about but not the title or author. Maybe somebody out there knows it? I’d love to find a copy! 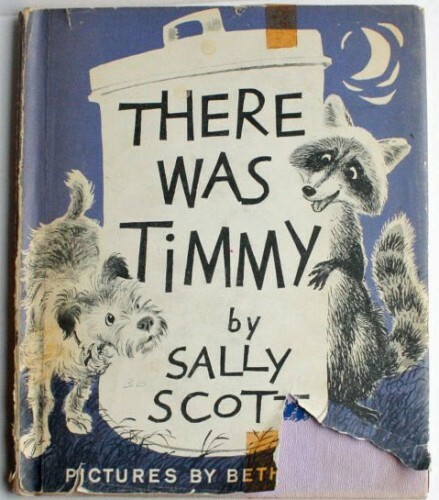 It was about a puppy named Timmy, and had as its refrain: “And there was Timmy—right spang in the middle of everything.” I still love that word “spang.” We also had a set of Childcraft books in our home when I was growing up, and I especially loved the poetry volumes. My favorite authors as a middle grade reader were C.S.Lewis and Madeleine L’Engle. I was very much a reader of fiction and poetry and didn’t read much nonfiction. I’ve always felt that good fiction is in some ways “truer” than nonfiction because it speaks to the heart. Patty: You sound just like me! I adored reading as a girl. Is this love what inspired you to become a writer? Barbara Jean: My fourth grade teacher, Mrs. Green, started me on my writing path. We were studying westward expansion in social studies, and she gave us an assignment to pretend we were a child in a wagon train and write a diary of our journey on the Oregon Trail. I must have written 30-35 single-spaced pages, and I’d never had so much fun. Thank you, Mrs. Green, wherever you are! Patty: Many people would love to write a picture book. I know I would! 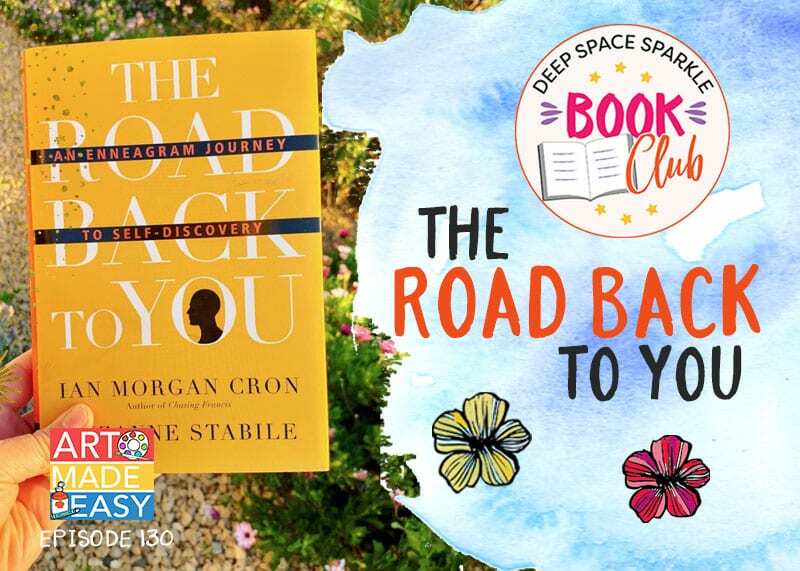 Can you describe your path to publication? Barbara Jean: I was newly married and living far from home, my husband was working full time and going to school, and I was lonely! So I signed up for a “writing for publication” class at the local adult school. It was a good introduction to what it takes for a writer to become a published author. I met a friend there who had been trying without success to get a romance novel published. She liked the writing I was sharing in class and asked if I would help her revise her novel for a new market that was opening up. I did, and we sold it in six weeks. We wrote another book together, and she decided she wanted to write on her own. It took me several years, but eventually I too started writing romance novels of my own. That lasted until a particularly snarky reviewer said of one of my books: “Ms. Hicks really ought to be writing for children–no one else could appreciate such silliness.” Ouch! I crawled into bed, pulled the covers over my head, and swore I’d never write again. Then the light bulb went on. Maybe I SHOULD try writing for children. Maybe that’s where my best gifts lay. So thank you, Mr. Reviewer, wherever you are! It didn’t happen immediately, though. My first attempt, a story based on my cat, sat in my drawer for a long time and eventually, in a much different form than the original, became my fourth published children’s book, The Secret Life of Walter Kitty. My second attempt, Jitterbug Jam, became my first published picture book–but it took 22 rejections before an editor at Random House in London read it and fell in love. I sold two more books to her, I Like Colors and I Like Black and White, but she didn’t love Walter Kitty! I was fortunate to have Walter critiqued at an SCBWI event in Seattle by an editor at Knopf, and she invited me to revise it based on her comments and send it to her. She also became my editor for Monsters Don’t Eat Broccoli. Sometimes it’s pure luck that a manuscript lands in the right hands–but we can improve our chances by taking opportunities and persevering. Patty: You mentioned that you loved art and would like to illustrate your own picture book someday. What type of art do you like to create? Barbara Jean: My style is more graphic than painterly and I really enjoy making what I call cut paper applique. I’ve created several images of the black and white cat who inspired The Secret Life of Walter Kitty that I use to market my school visits and student publishing services. I like bright solids and I also enjoy using wallpaper prints for my illustration work. Patty: Is there an illustrator whose work you admire? Barbara Jean: Many! Oldies but goodies: Dr. Seuss, Maurice Sendak, Quentin Blake. Current: Chris Van Allsburg, Brian Selznik and Shaun Tan’s pencil work is amazing–something I don’t think I could do in a million years! Then there’s Diane and Leo Dillon, Julie Larios, Kevin Hawkes, Laura Vaccaro Seeger–stop me! I’ve also been extremely blessed with the illustrators chosen for my own books–Alexis Deacon, Lila Prap, Dan Santat and Sue Hendra. Their styles are all extremely different but each is so well suited to the text he/she illustrated. Patty: If you could spend an entire day doing just one thing, what would it be? Barbara Jean: Traveling through the Tuscan countryside–which really is more than one thing because you have to stop so many places along the way to eat, drink and be merry! It’s a magical place. Patty: Wow! Thank you so much Barbara Jean! I am so inspired by your writer’s journey. To enter to win Monsters Don’t Eat Broccoli, scroll way down past the Art Tutorial and leave a comment listing some of your favorite children’s book–vintage or new! 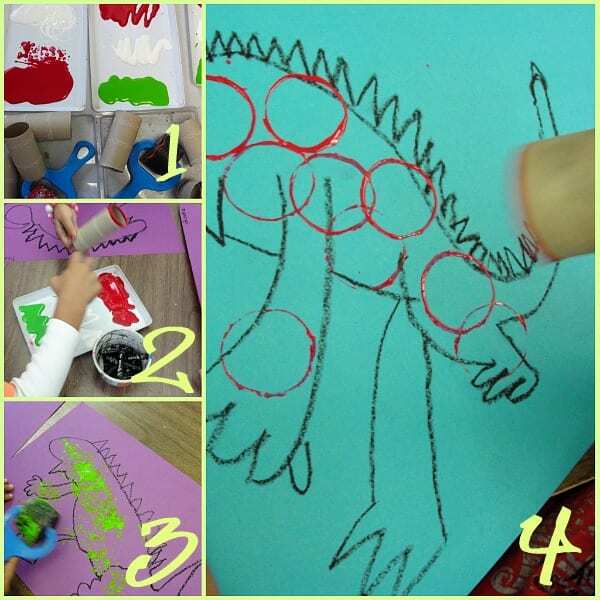 Monsters are a favorite subject for any art project but especially for first graders. I read Monster Don’t Eat Broccoli to the students and decided that skyscrapers would make a fantastic backdrop for our hungry monsters. Set aside three, 45-minute art classes for this beauty. 1. Squirt some colored tempera paint into flat trays and place on tables along with a paper towel roll section for each child. 2. After drawing a monster with a black oil pastel, dip cardboard roll into paint and stamp circles onto monsters. 3. If you have texture rollers, you can apply the paint in this manner as well. Some kids did both. 4. Place monster on drying rack. We’ll come back to him a bit later to add the details. 5. 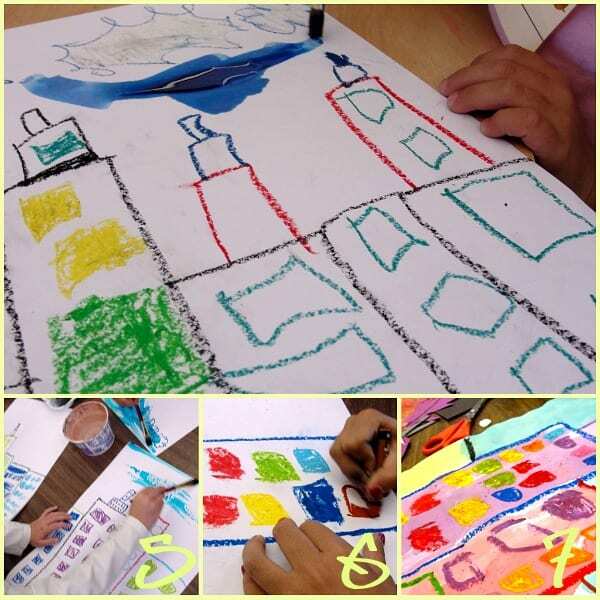 On the white piece of paper, draw skyscrapers with the oil pastel. Draw rectangles across the bottom first. Then, add a second layer of skyscrapers behind the first row. 6. Add squares and rectangles for windows. You can chose to color in some windows or leave them uncolored. 7. 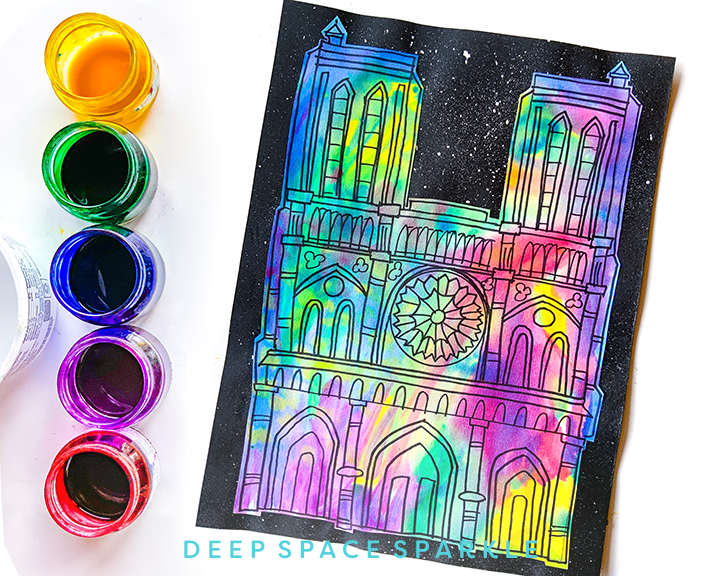 Fill the skyscrapers and sky with liquid watercolors. If you don’t have liquid watercolors, pan watercolors are fine. Set aside to dry. Cut out the monster and glue to the background paper.Now it’s time for some fun! Set out a tray of colored paper scraps and add eyes, teeth, spikes, extra arms and legs, stripes or anything else that you think would make your monster happy! Love this lesson on monsters? Click the yellow button below to download a free lesson PDF on how to draw monsters! the book looks like such fun! 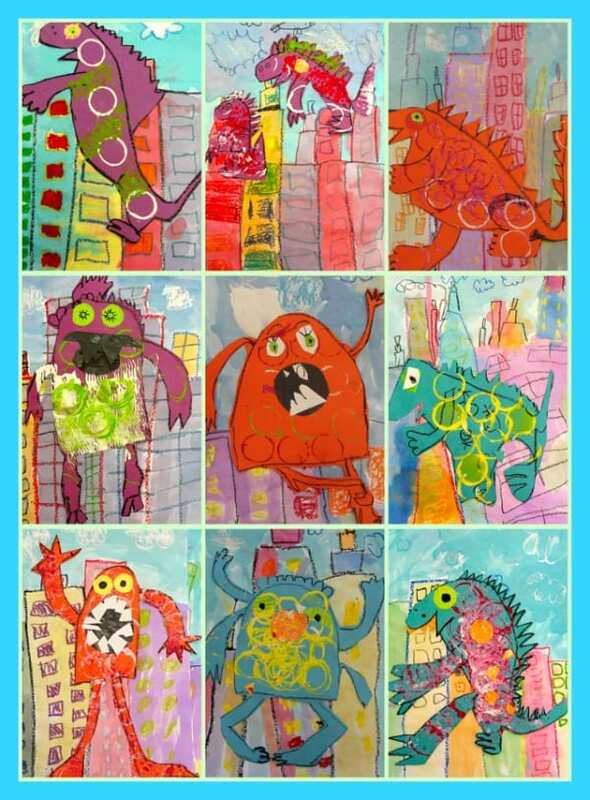 i know students would love it:-) and what fun monster art by your 1st graders! Super Lesson! Connections Connections Connections…That is what art does. It connects us to our world. 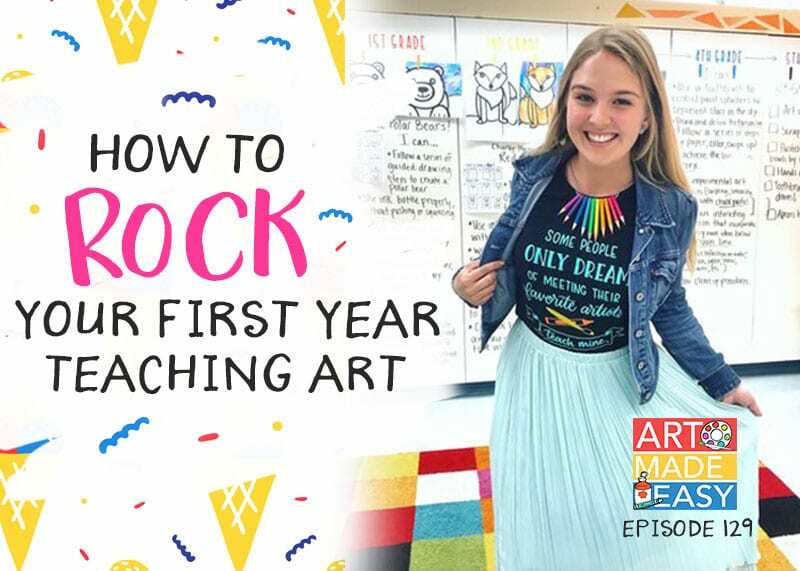 Literature, Science, Social Studies, Math, Music, ALL BELONG IN THE ART ROOM! Thank you for sharing these two gems…the book and the lesson. BTW. The Childcraft set had a huge impact on my development as well. I loved the firsdt two the most. The illustrations were so soothing. My students love stories about monsters and animals ! Linking a great picture book and story with an art lesson is a great way that I get my students engaged in the lesson ! Furthermore, I admire artists that create books for children. 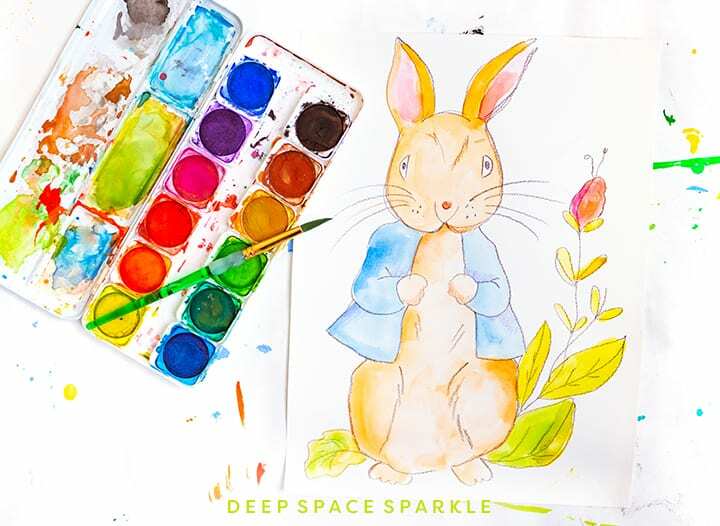 With all the wonderful books that are out there for kids, writers and illustrators still continue to come up with new and creative themes for children’s books every year ! Love your lesson plan and so much fun with such a wonderful book! Will have to put this one on my “wish” list – just in time for Christmas. Thanks! Love this! Saving for next semester’s art class! Great story. This looks like a fun art project. I love using pastels and paints – a winning combination. Looks like an awesome book! great art activity! My favorite book id i ain’t gonna paint no more! !! What a fun and whimsical book Barbara Jean has created. The illustrations look so colorful and vibrant, they seem to match the humorous story perfectly. 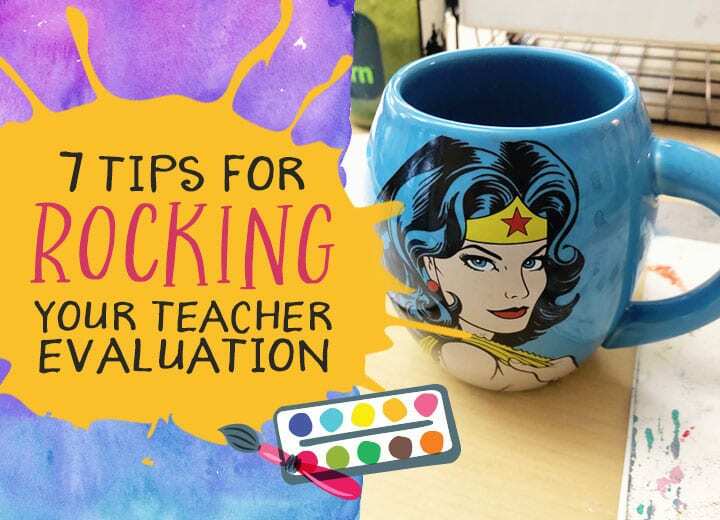 I would love to use this book along with Patty’s fabulous lesson to teach my students. This will be another fun lesson similar to the terrific one using the book, Saturday Night at the Dinosaur Stomp. 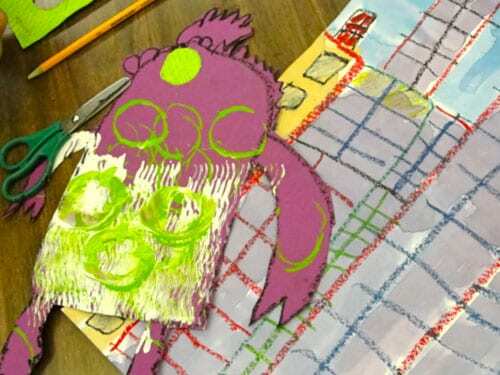 Children love to draw Monsters, how clever to incorporate the story into a fun and creative lesson using mixed media combining oil pastels, colllage and watercolor.I bet this will be a big hit with my students. 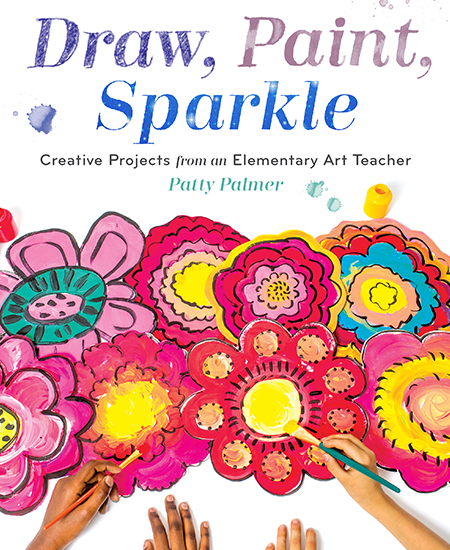 wonderful books for inspiring an art lesson! I love using books as inspiration. It’s even better when after I’ve used a book in my class, the libarian will come up to me and say “All these kids just asked me for this book, or for books about (whichever subject). 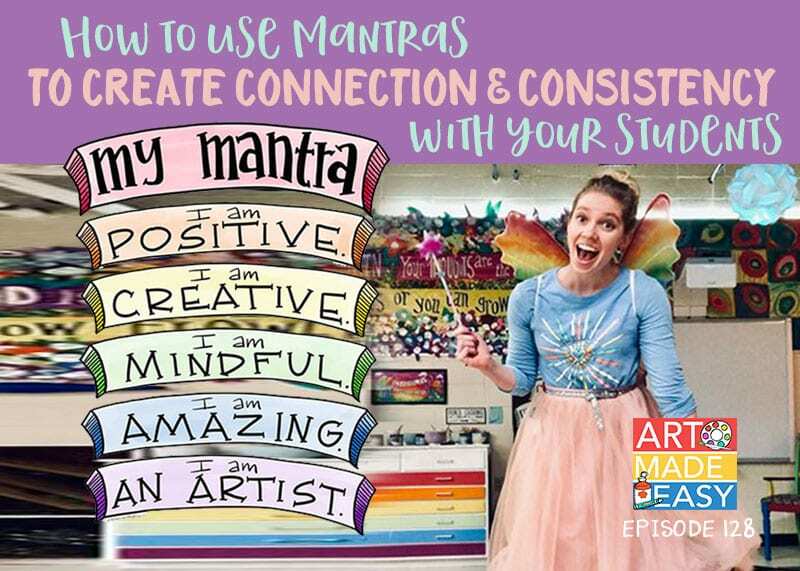 It’s great when the literacy connection leaks out of the art room and into other areas. I love your “Monsters Don’t Eat Broccoli” art lesson Patty! I know the kids had a ball making these. I’d like to try it sometime. Thanks! 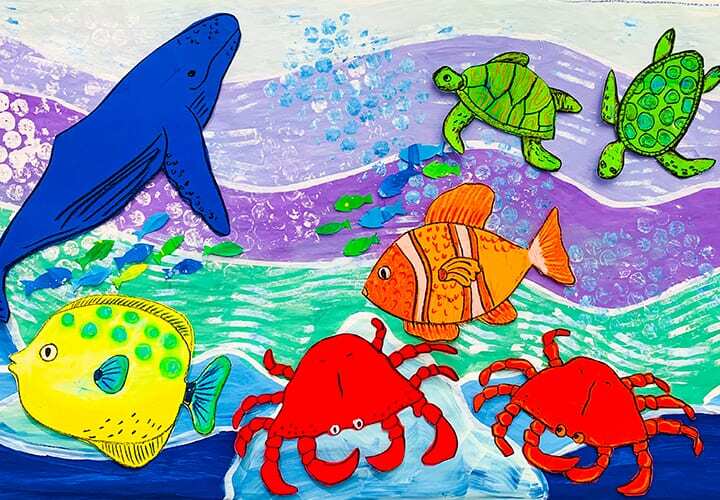 Anything Eric Carle! In the more vintage category, J. P. Miller’s painting are utterly charming. Fun project and looks like a great book! Patty, I can’t BELIEVE you found “There Was Timmy”! Now that I know the title and author, maybe I can find a copy for myself! Your art lesson and the kids’ results are amazing–thank you so much for using Monsters Don’t Eat Broccoli to inspire such fabulous art. And for the interview too. I’m very happy I’ve found your website/blog–I’ll be recommending it to teachers, artists and the homeschool parents I work with. Your site is a gift and an inspiration! What a fabulous site this is! I am SO impressed. I love the way you go to great lengths to find people like Barbara Jean Hicks to share their stories with all of us! I would LOVE to have her book! My Favorite book from childhood was, A Wrinkle in Time, by Madeleine L’Engle. I inspired my love of reading for the rest of my life as well as my fascination with Science Fiction. My current faves are, Only One You,Splat the Cat, Grandpa Green, and anything by Dahlov Ipcar. Her illustrations are stunning! Thanks, Patty! What an inspirational story! And a fantastic book to boot! I love children’s books so much. Wabi Sabi by Mark Reibstein has beautiful artwork by Ed Young. Another author / illustrator I enjoy is William Joyce. I love integrating literature and art. This book is going to be a lot of fun! Thanks for sharing the great art lesson that goes with Barbara Jean Hick’s book. Your first graders did a wonderful job of making their monsters and skyscrapers. I teach kindergarten and hope to try the art lesson later in the school year when the kids have matured a bit more. Thanks for sharing the book. It looks cool. Thanks for the great interview, book, and lesson plan. As always, your blog is so inspiring!! 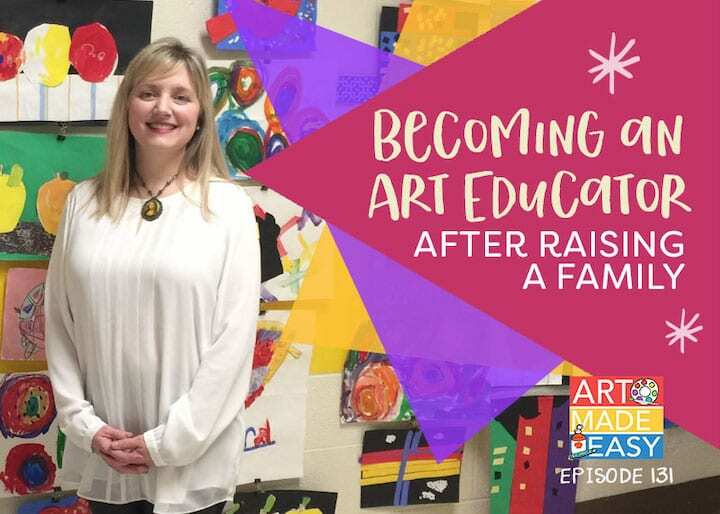 A great art lesson and an inspiring story from a children’s book author!?! It does not get any better than this! The kids’ art is absolutely FABULOUS! I love the idea of having them do the background separarely so that they can position the monsters in more creative ways. Thanks so much for posting this interview and the related activityi! So many, but I consider Lafcadio, The Lion Who Shot Back, a hidden treasure. It is not a collection of poems for which Shel Silverstein is so know for, it is a chapter book. It is always the first book I read to my first graders. His use of lines only to illustrate his work is also something we study in art. I can’t wait to read Monster’s don’t Eat Broccoli… I know my students will love it. I always enjoy stories about writers who are persistent in following their dreams. Well done, Barbara Jean! A favorite childhood book is Ferdinand. My current favorite fall picture book is Jane Yolen’s The Scarecrow’s Dance. Luminous illustrations! I enjoyed reading about Barbara Jean’s path to getting published – hearing that her manuscript was rejected 22 times is incredible; it’s depressing that the market is so competitive, but it’s also encouraging to me that I need to have faith in my own stories and keep sending them out. Loved the first graders’ monsters!! I absolutely LOVE connecting literature with art…what an easy and successful lesson with monsters and veggies. Thank you for updating your website regularly…it rocks! ooohh…i found you through pinterest! the book looks awesome and i would love a chance to get a copy! thank you for the opportunity! Love this idea. I am an art teacher but my son, a first grader, saw this lesson when I was looking at your site and immediately asked if his class could do it. Very catchy for this age. Thanks again for great inspiration. I always use books as a jumping off point for my k-2 afterschool art classes. However, no matter how many ideas I threw out last week I couldn’t get them excited about the over ground/under ground project we were working on. Imaginations just weren’t going there! And the results reflect their frustration. And then today…the solution! MONSTERS! So next week we will add to what we are doing and finish as backgrounds and MAKE MONSTERS which I know will kick up the creativity. Great find when I was actually looking for the truck lesson to help motivate the guys!